One of the oldest and most reliable tactics for reliable concealment is to deploy a cover garment of some sort. Granted, this may not be strictly necessary as many holsters and pistols require no more than a T-shirt to reliably conceal. However, some people like a little more concealment than that and not all holsters and pistols are easily covered up with a mere t-shirt. If that's the case, there are some very easy concealed carry clothing tricks that can help. One of the most common cover garments is a concealed carry vest. There is nothing, despite the headline, inherently wrong with wearing a vest for concealment purposes. However, there are a few inherent issues with wearing a vest. For one, wearing a vest can be a dead giveaway. During colder months, it's perfectly normal and no one would care or look twice. During the summer though...that's another story. Also, wearing what is clearly a tactical or outdoor vest when you work in an office...is a bit strange. There are vests for business/formal wear, but they aren't necessarily good for concealing much more than, say, a slim pistol in a shoulder holster worn under the vest. For those that carry a handgun on the beltline somewhere between the small of the back and the 3 o'clock position, one of the best cover garments is an unbuttoned button-up shirt. This works even better with a shirt that happens to have a long tail. This kind of cover garment drapes fabric a bit further down past the beltline, often to about pocket level or further, depending. 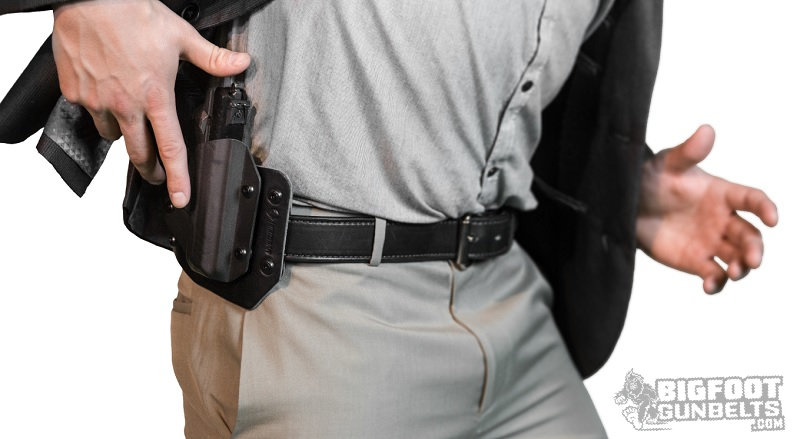 This concealment method works well to cover up a handgun that's being carried inside-the-waistband, if a person is overly concerned with printing. Some people are - and rightfully so - close to obsessed with avoiding printing, and will go to great lengths to avoid it. Additionally, this is a very easy method to conceal an outside-the-waistband holster that rides moderately high. Granted, a great many high-ride OWB holsters can be concealed with only a t-shirt, depending on the gun. Concealing, say a Sig P226, Smith and Wesson K-Frame, or 1911 in this manner can be done but isn't the easiest or most reliable with this method. Concealing, say, a S&W M&P Compact, CZ-75 Compact or Ruger SP101 in this fashion...is easier. 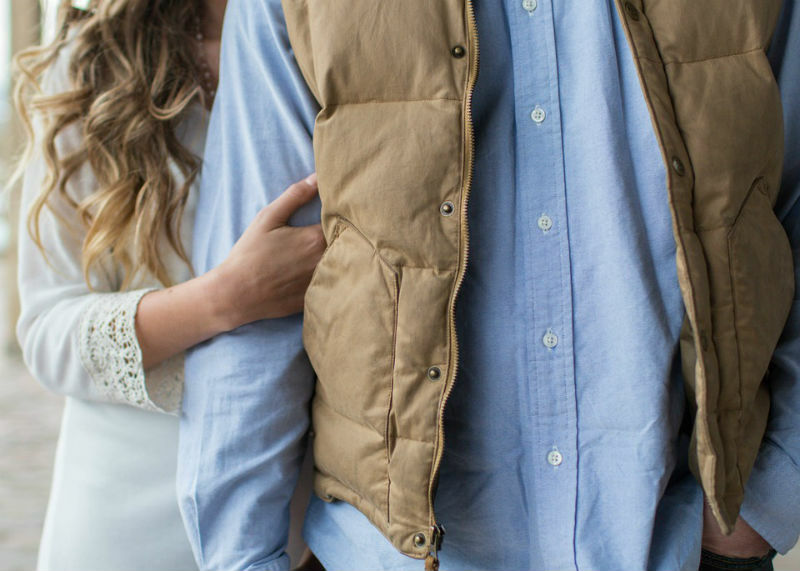 During autumn, a shirt jacket is perfect for concealing this kind of carry. That said, it's a very reliable way to conceal a big iron on the hip if desired. If the gun must be accessed, the garment can be easily cleared while drawing, as one merely needs to sweep the shirt tail rearward. Another good cover garment for concealed carry is a ¼ zip pullover or similar pullover shirt or sweater. Unlike a jacket, these can be light enough to wear all day in almost all seasons. This is a near-universal concealed carry strategy, and can be employed by nearly anyone to conceal a firearm. Just like the unbuttoned button-up, a pullover of sufficient length can conceal an IWB holster or a high-riding OWB holster. Such garments are easily acceptable business-casual wear, and are not out of place in the office environment. 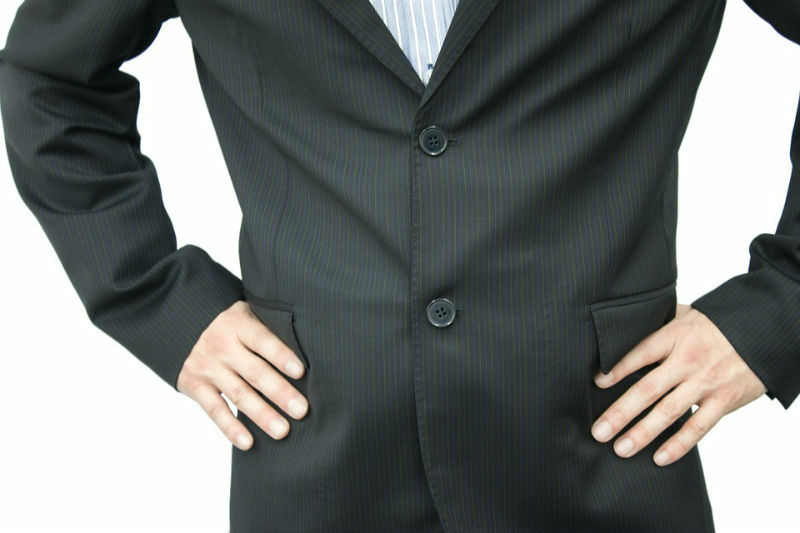 However, unlike an unbuttoned button-up, this type of cover garment can also easily conceal appendix carry, which an unbuttoned longer shirt is no help with. Drawing is slightly more complicated, as it requires the wearer to lift the cover garment before gaining purchase on the grip. If such a garment is worn on a regular basis, the draw needs to be practiced in order to gain proficiency with clearing cover. Granted, practicing gun drawing techniques should always be part of defensive pistol practice. During the summer months - or if a person just likes dressing this way - a pullover or any other warmer type of clothing is not practical...but a Hawaiian shirt or guayabera shirt may well be. Both of these garments are popular in warmer climates and can become a concealed carry asset, in the right circumstances. 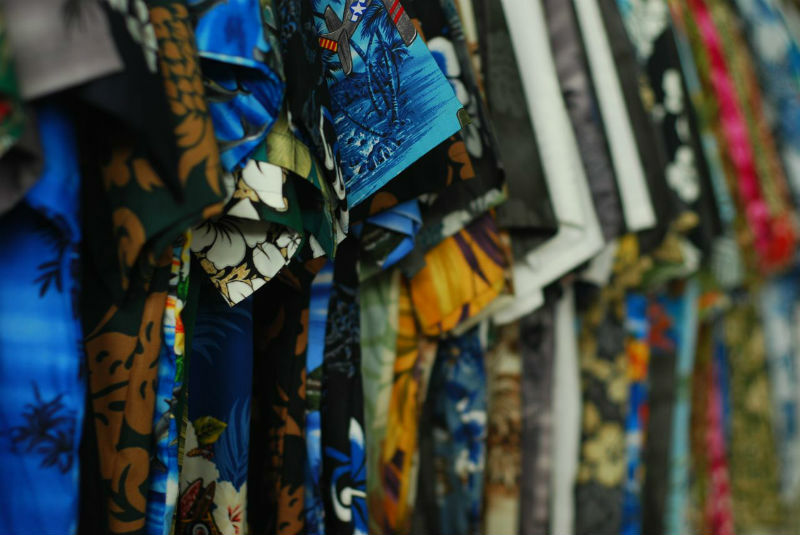 Hawaiian shirts are so named for the tropical-themed prints, but the original shirts that become popular (and ultimately iconic) were made from rayon instead of cotton, which makes a difference. Rayon is a textile made from cellulose fibers derived from wood pulp. Rayon doesn't insulate heat at all, and breathes very well - making Hawaiian shirts (and other rayon garments) very popular for hot climates. Guayabera shirts are popular in Latin America or areas with large Latin American communities. They have two to four patch pockets on the front and two vertical pleats on the front and back. Long and short sleeve versions are common, with the short sleeve variant more common in hot seasons and are often considered formal wear during summer. Like the Hawaiian shirt, it's worn untucked. Both garments are perfectly acceptable summer wear, aren't uncomfortable during the hot season and can easily cover a concealed pistol anywhere on the beltline. Not everyone wears one, but a blazer or a sportcoat in all but the warmest of months are likewise very effective for cover garments. During the warmer months, a linen or seersucker jacket may do likewise without being overly warming. Unlike an actual suit jacket, blazers and sport coats have a more casual cut, meaning there's more room inside them. This makes them ideal for concealing all but the largest of firearms. If unbuttoned, the draw is a simple backward sweep for strong-side carry to gain quick purchase. Plainclothes police and federal agents have been wearing them for years though - and this is a key point - they usually have them tailored to accommodate a firearm. You might be able to avoid having to have that done with a sport coat or a blazer, as the fuller, freer cut compared to a suit jacket can give one enough wiggle room. Most compact pistols are going to be fine, but larger service-size pistols may require an alteration. 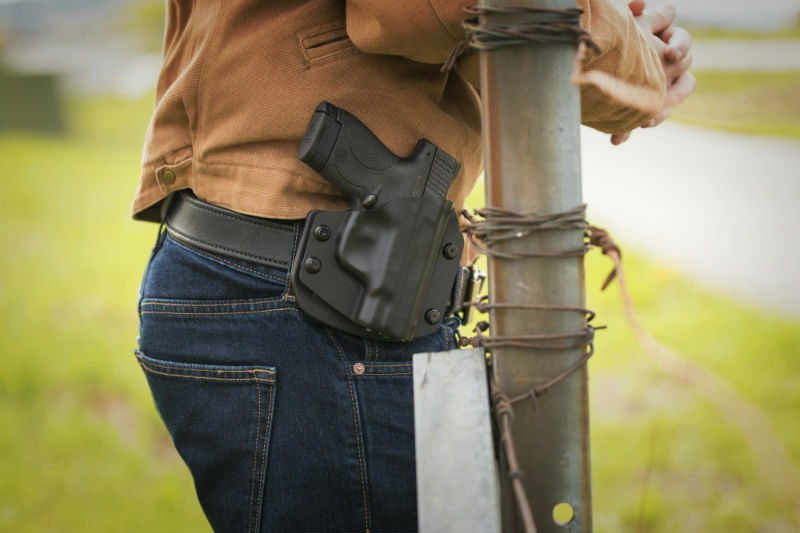 None of the above cover garments are perfect, year-round concealed carry clothing solutions. Some may be three-season only or two-and-a-half season only solutions. However, all will work and all have a track record among many carriers as being capable concealment solutions if one can't effectively conceal with a mere t-shirt.